Home / News and Events / News / New Faculty Publication: Eric Porter "The Problem of the Future World"
Eric Porter, Professor and Chair of American Studies, has a new publication available! The Problem of the Future World is a compelling reassessment of the later writings of the iconic African American activist and intellectual W. E. B. Du Bois. As Eric Porter points out, despite the outpouring of scholarship devoted to Du Bois, the broad range of writing he produced during the 1940s and early 1950s has not been thoroughly examined in its historical context, nor has sufficient attention been paid to the theoretical interventions he made during those years. Porter locates Du Bois’s later work in relation to what he calls “the first postracial moment.” He suggests that Du Bois’s midcentury writings are so distinctive and so relevant for contemporary scholarship because they were attuned to the shape-shifting character of modern racism, and in particular to the ways that discredited racial taxonomies remained embedded and in force in existing political-economic arrangements at both the local and global levels. Porter moves the conversation about Du Bois and race forward by building on existing work about the theorist, systematically examining his later writings, and looking at them from new perspectives, partly by drawing on recent scholarship on race, neoliberalism, and empire. 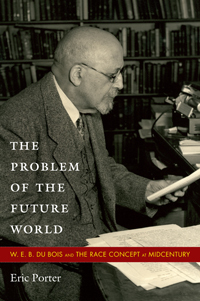 The Problem of the Future World shows how Du Bois’s later writings help to address race and racism as protean, global phenomena in the present.